November 19th, 2015 – The Used has announced limited Meet & Greet and Side Stage packages for their upcoming 15 year anniversary tour. A portion of proceeds from each purchase will be donated to Living The Dream Foundation. Both packages include a photo op with the band, early entry to the show, the upcoming CD/DVD Live & Acoustic At The Palace, a signed set list, a tour laminate, a tour t-shirt, and a tour poster. The packages do not come with a general admission ticket to the show – these must be purchased separately. The meet and greet package (limited to 50 per show) additionally includes a meet and greet with the band, while The Side Stage package (limited to 5 per show) includes side stage viewing of the band’s set. For more information or to purchase one of these limited packages, please visit http://theused.net/. General tickets will be on-sale to the public tomorrow, November 20th. 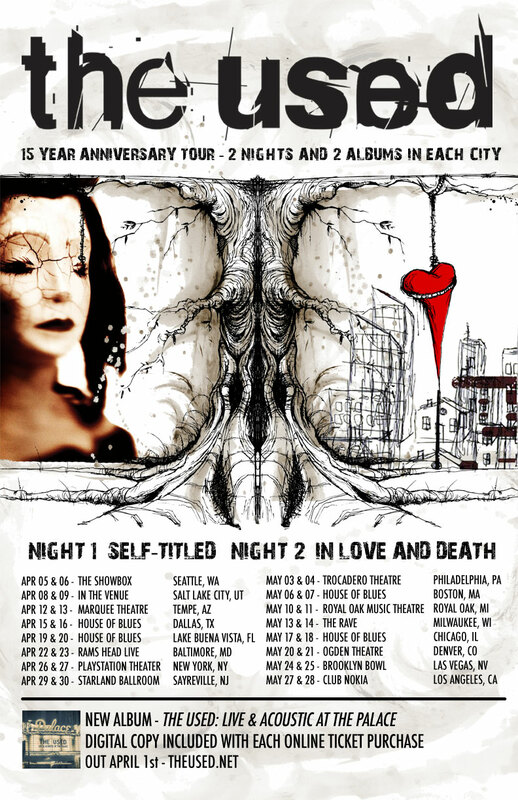 In celebration of their fifteen-year anniversary, The Used will be hitting the road for a North American tour in spring of 2016.The band will be playing two shows per city, performing Self-Titled and In Love and Death in their entirety, plus more each evening. The tour will kick off on April 5th in Seattle, WA and wrap on May 28th in Los Angeles, CA. With each online ticket purchase, fans will get a digital copy of the band’s upcoming release, The Used: Live & Acoustic at The Palace. Tickets will be available this Friday, November 20th at www.TheUsed.net. 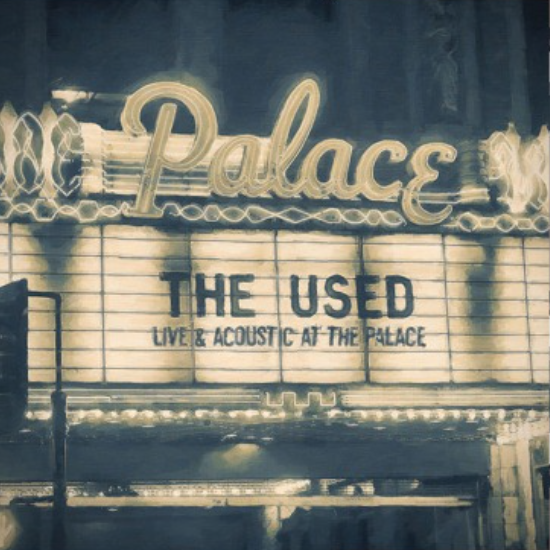 The Used has additionally announced their newest album Live and Acoustic at The Palace, a live CD/DVD, which is set to drop on April 1st, 2016. Fans can choose from four different bundles for pre-order here: http://theused.net/, or pre-order the album on iTunes here: http://bit.ly/theusedliveacoustic. Live & Acoustic At The Palacewas recorded at the band’s intimate unplugged storyteller performance, which took place at The Palace Theater in Los Angeles last month. Fans who were unable to attend the once in a lifetime performance will have a chance to watch the band perform in a way they have never performed before – with a 4-piece string quartet and harpist (arranged by Hiro Goto), a piano player, percussion and a 3-piece gospel choir. Fifteen years ago, four teenagers from Utah created a band and released a collection of albums that shaped the space of the alternative rock scene. High energy live shows, gut wrenching relatable lyrics, and melodies that blended pop sensibility and hard rock was the perfect combination to make an everlasting impression on fans globally. 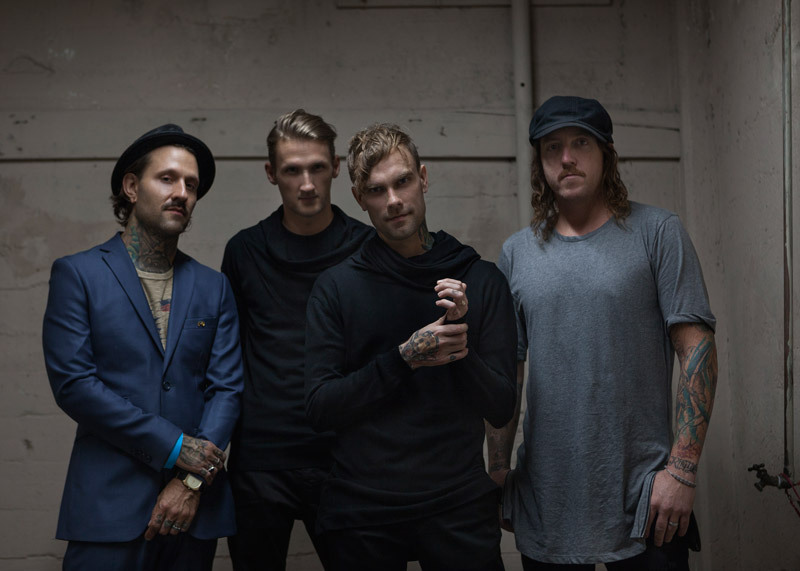 Since forming in Orem, Utah in 2001, The Used have released 6 albums and 2 EPs – The Used (2002), In Love and Death (2004), Lies for the Liars (2007), Shallow Believer EP (2008), Artwork (2009), Vulnerable (2012), The Ocean of the Sky EP (2013), and Imaginary Enemy (2013). The Used’s latest LP Imaginary Enemy put the band’s political frustrations and commitment to social change at its forefront and has opened up the platform for conversation among fans and critics alike. The album climbed high on the Independent, Tastemaker Albums, Hard Rock, Alternative, Digital Albums and Top Rock charts. Fans can purchase Imaginary Enemy on iTunes here: http://bit.ly/ImaginaryEnemy. Going into year 15, The Used are stronger than ever and are looking forward to an incredible evening of making memories. The Used is Bert McCracken (vocals), Jeph Howard (bass), Dan Whitesides (drums), and Justin Shekoski (guitar).